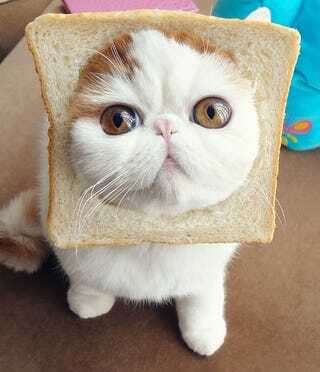 It Would Be Distasteful to Call this Kitty, "Inbread"
Though there may be a whole grain of truth to that statement, we need to spread love and stop being so jelly of how others are raised. I wish I could glue ten banners together in order to remind all those crusty ol’ people out there rye their half-baked preconceptions are crumby and knead to change. Life’s a roller toaster for everyone so stop pushing people down! Don’t we all suffer through varying degrees of heat just to pop black up butter than ever? I mean cereally! *Now I would feline to you if I said I knew what was going on. I’m loafing around and tabby honest, I just felt like spinning a yarn. I’m wrapping up for the day sew I really don’t need to be discussing pedigree.